Panguipulli is one of the small rural towns in the heart of the Chilean Lakes Region, where they essentially roll up the streets at night. By all means a working class town, but with an interesting mix of business people, as well as commercial farming and cattle operations. 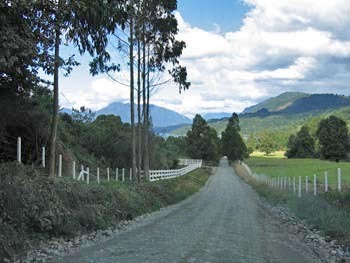 There are also a number of well to do property owners controlling large tracts of land (fundos). Some land lies quietly being enjoyed only by its owners while other parcels are hard at work being developed as small retirement subdivisions. 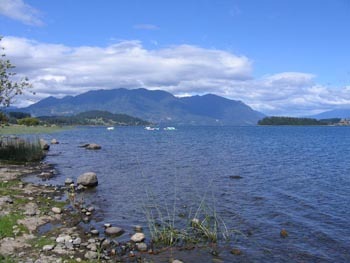 This community bears the name of the beautiful scenic lake on whose shores it rests. It claims a population of 8,500 but walking the downtown you'd never know it. That's because many of its inhabitants have tucked themselves away into the hidden and scenic folds of the nearby Andean foothills. 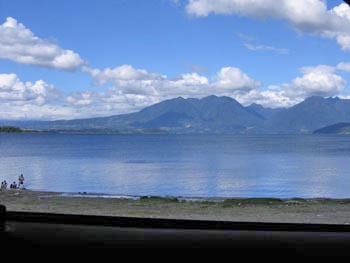 The views over the Lake and northeast towards Mt. 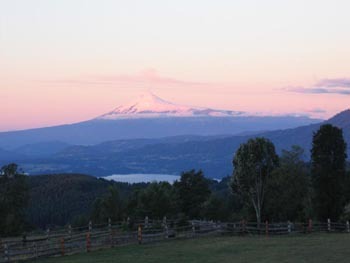 Villarrica (Volcano) can be absolutely breathtaking. An average tourist's snapshots of the area will look like they are taken by a professional photographer. Really! 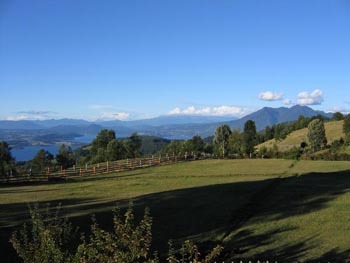 The attraction of Panguipulli is all about the rural tranquil environment, the splendid scenery and the right to be left alone to enjoy just those aspects. If you're a person who craves a busy social life, lots of community activities, shopping for the latest fashions on a boutique crowded street, hanging at "the" trendiest café to see and be seen, then this is not the place for you. The town's charms are totally rural. And what aesthetics the downtown does possess are totally overshadowed by the incredible natural beauty that surrounds the area. There are no designer shops sporting granite facades with high end finishes selling the latest Bed Bath & Beyond creations or Timberland branded shoes here. Think "The Waltons" (80's TV show). Stores with rough sawn siding, and last season's paint job, but still having all of the basics and essentials you'd need on a regular basis. Even including a medical clinic, 2 pharmacies and 3 small supermarkets. You can enjoy the isolation of being far up on the mountain range living beyond the reach of civilization yet within a reasonable ½ hour drive from town to pick up weekly supplies. Consider a small lake view plot in the mid-lands or large farming fundo in the lowland growing areas with river frontage. There are many choices available, without the nosebleed prices you'll find further north in the country. Besides the spectacular mountain & lake views there are many area outdoor activities at your beck and call. 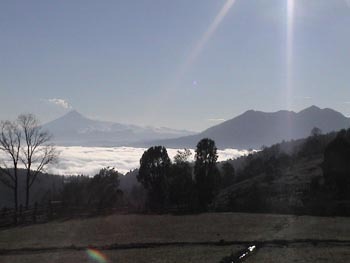 There are literally dozens of hostels, bed & breakfasts, and a few mid-range hotels around. Enjoy a therapeutic soak in one of the thermal hot springs, go biking and horse back riding, trout fishing, swimming, camping or even river rafting for the adrenaline junkies in us. 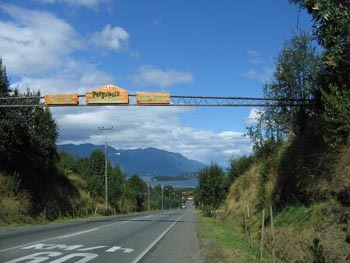 For those curious about Argentina there is a regular ferry crossing point on nearby Lake Pirihueico,… but don't forget your passport. Here in all matters you can take your time. Life is slower. No need to rush. Take your time and have a leisurely stroll about the rustic downtown. Enjoy a delicious (grass fed) beefsteak with fries. Order a cheese pizza from the pizzaria on your way to the Internet café. Use your cell phone to call up home on the mountainside to tell your family that you'll be late. Hang out in the evening with a few neighbors and have a leisurely coffee or a few beers. You're on slow speed now remember? When you feel like a movie or hanging at a pub or restaurant and doing the "college town type" gringo scene then Pucon is a little over an hour away from the center. Need to do some heavy shopping and stocking up with a wider range and selection of Super Wal-Mart sized shopping then there is a Jumbo's Market in Temuco (about a 2 hour drive) and many other options there for higher end home goods, clothing and automobiles. 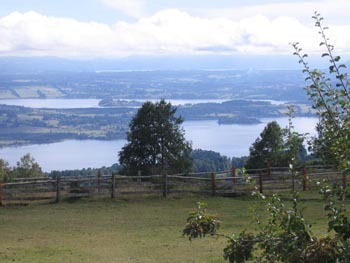 The quaint port city of Valdivia is another within range option for shopping and diversion or fresh just-off-the-boat seafood, when civilization calls.